One of the most effective ways of defining space in a garden is with hedges. 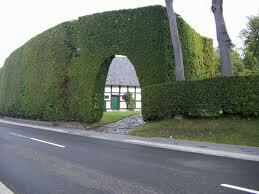 For centuries, especially in European gardens, hedges have been a common design element. Here in the states hedging has suffered from an undemocratic image as being unfriendly and perhaps boring. In fact, when I was in school our design professor who was a student of the influential teacher Ian McHarg, had no interest in promoting the use of a hedge. He favored a strict imitation of natural systems. Although the program was highly enlightening it was also stifling to design as if everything should be a replication of an ecosystem. To this day I use allot of natives in my designs but I have grown to appreciate all styles of garden design and frequently will use hedging in different ways. Think of the hedge as a living wall which depending on the plant used may be anywhere from fortress like to diminutive.Some hedges are purely decorative, while others serve a practical function. Hedge plants used decoratively are often trimmed to precise sizes and shapes and include evergreen and deciduous trees and shrubs. Piet Odoulf's informal planting with a Taxus and Beech hedge in the background.